“The font was created much like any other, I suppose. At an early point in Finale’s development, Coda realized that relying solely on the Adobe Sonata font was not a good long-term strategy. For one thing, it didn’t have nearly enough symbols in it. For another, Phil Farrand, the original programmer, had to practically stand on his head to get things like flags to line up correctly. You should have seen all the ‘secret’ parameters and ‘offsets’ that were required to make Sonata work. It worked, but it was obvious that Adobe had no intention of improving it, and that Finale’s future development might be slightly encumbered as a result. I was working on the early documentation at the time with Jim Romeo of Romeo Music and his business partner, and fellow musician, George Litterst. The need for a font arose and as I was fairly competent in the graphic arts, I got the gig. I had to create the font very quickly. I think I did it in about eight weeks. By contrast, I believe that Cleo Huggins, Adobe’s designer on Sonata, had about six months to work with. Petrucci had more than twice the number of useable symbols. At the time, it represented the largest music symbol selection available for a desktop computer. While the Sonata font was based on the traditional Letraset press-on music symbol set, Petrucci is not strictly-speaking based on anything. I had always appreciated the look of the famous Peters piano editions. I liked the old-style look for classical music. But Finale would, of course, be used for all kinds of music, so something that traditional wouldn’t have been appropriate. Ultimately, Petrucci struck me as something of a hybrid: not ‘new’ like Sonata, not ‘old’ like Peters. To be honest, my skills were not sharp enough to truly capture another type foundry’s design. Petrucci bears little resemblance to Sonata. Among other things, Sonata is considerably smoother. My ability to place “control points” back then was not what it is today. There’s still a little ‘hump’ on the treble clef that I use to detect Petrucci whenever I see printed music. I must have worked 20 hours to get that hump smoothed out, but I never quite got it right. Other symbols also have unintended irregularities. I guess you could say they add character, no pun intended. In truth, I was in over my head. Petrucci was the first font I ever worked on and I just hoped it would be good enough to get Finale off to a good start. I think it succeeded but I’m also glad that Finale’s font selection has improved right along with improvements in the program itself. I finished the font several months before Finale 1.0 was released. It had to be done this way because Phil needed to tune the placement of symbols under a variety of different circumstances. It took many, many printouts to get everything right, and at certain points, he asked me to make small adjustments to certain symbols, usually to move them up or down by a fraction of a point or so. The font existed for several months without a name. We had just assumed that it would be called ‘The Finale Font’ or that Coda would choose a name. But as the program neared release, no name seemed forthcoming. So Jim and I were sitting around thinking about what to call it and we thought about how Aldus had gotten its name from Aldus Manutius, the great printer. So Jim and I tried to figure out who the first printer or publisher was to set music using moveable type. That turned out to be Ottaviano Petrucci. And that’s how the font got its name. Over the years, so many wonderful music fonts have been created that I really think Petrucci is a little ‘long in the tooth.’ As I said, I was not a great designer at the time, nor did I know much about the subtleties of symbol font design. Up to that point, I had only worked with text fonts and only as a self-schooled graphic artist and desktop publisher. Turns out there are just as many concepts to music font design — they’re just all different. At the MacWorld Boston release of Finale, I was accosted by this Finnish gentleman who proceeded to give me several long lessons in music font design. This amounted to a litany of things I’d done wrong. 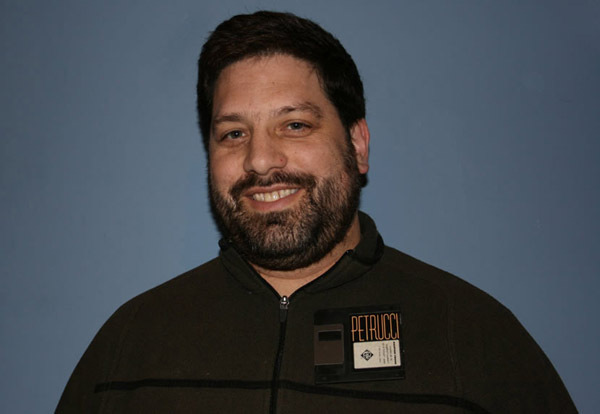 However, as the fellow finally conceded, Petrucci was the best font available for a desktop computer program and in that sense he judged it to be at least moderately successful. But he hoped that I would ‘fix’ it as soon as possible and that I would continue to rev it at least once each year. Obviously, that didn’t happen. Personally, I love the way Finale ships now with so many font choices. As a former jazz arranger, I’m partial to handwritten fonts and I was really excited when those became available. ‘Charts’ done in Petrucci always drew snickers from the horn players. After creating Petrucci, Steve hung up his Bezier curves – he considers himself permanently retired from font design. Since then he has enjoyed a diverse career as a software developer, high-tech entrepreneur, and more. Today Steve is the president of Teaching That Makes Sense (TTMS), an education consultancy specializing in literacy, assessment, and educational leadership.